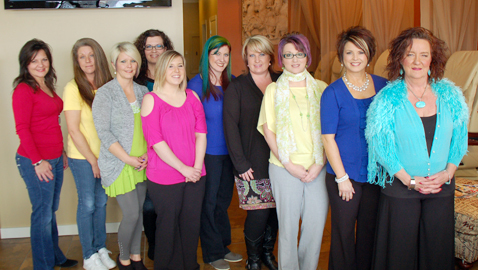 Pictured left to right: Melissa Sullivan-stylist, Edye Stallings-stylist, Donna Walker-stylist, Mandy Miller-nail tech, Tara Owens-esthetician and nail tech, Emily Ballantine-stylist, Tabatha Lyon-stylist, Christine Guinn-nail tech, Kelley Miller-manager/stylist, and Jo Ellis-stylist. Not pictured are Kathy Lee Evans-stylist, Crystal Haggard-stylist, and Shannon Roche-massage therapist. Style Makers Salon (& Spa) has been making-over Seymour residents for 17 years. Anthony and Libby Weatherly purchased the successful salon in October of 2012 from Jo Ellis and have been busy expanding the facilities and services offered ever since. Now, under new ownership and management, the salon has been expanded to include a 1,500 sq. ft. addition- which includes a full service state-of-the-art spa. One of the changes made includes the hiring of the salon’s manager Kelley Miller. Miller has been a licensed cosmetologist for 26 years and always dreamed of managing a salon and spa. According to Anthony Weatherly, her enthusiasm was contagious, and really sold he and wife, Libby, when the opportunity arose to purchase the salon. While excited to lead the Style Maker’s team, Miller also wants to remind readers that while a lot has changed, much remains the same. While Jo Ellis continues to serve clients as a stylist, one of those new faces is licensed massage therapist Shannan Roche’. Style Makers now offers a full range of spa services including massages, facials, manicures, pedicures, and waxing. To accommodate their loyal customers and new spa goers, they have also extended their hours. They are now open from 9 a.m. until 7 p.m., Monday thru Friday, and 9 a.m. until 5 p.m. Saturdays. For more information on Style Makers Salon & Spa, and the new services offered, visit them online at www.stylemakers-salon.com, or schedule an appointment by calling 865-579-6561. Mention this article to receive $5.00 off your next chemical treatment.